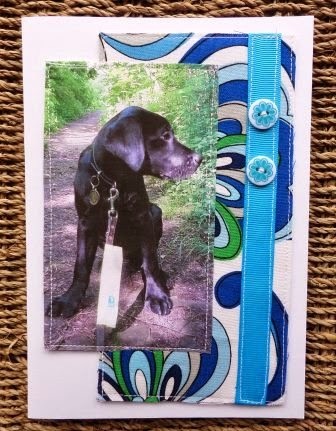 Usually, my post is split in two with handmade news and Guide Dog Puppy Quentin news... but this week handmade and Quentin have combined! Yesterday was my mum's 87th birthday - a cause for celebration if ever there was one! My mum adores Quentin, so I thought a present which had him in there somewhere might be a good idea! And cushions are always a good idea! 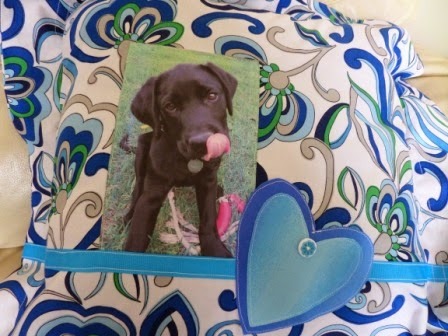 And after making the cushion, I thought a matching card might be a good idea too! The gorgeous swirly blue fabric was from Wholeport and the photo was printed onto washable cotton from Crafty Computer Paper (I've not tested how well it washes, I printed it using a bog-standard home inkjet printer, but it definitely prints well!). What's been happening in your world? If you leave your link we can pop by and read all about it! 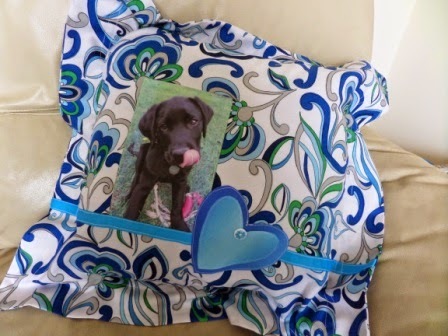 Your mum will love showing all her vsitors the cushion her very clever daughter made! That photo is 'sew' cute, I love how he is licking his lips, those sausages must be very tasty! Happy Birthday 'HH' Granny! Lovely cushion and present. Very cute with Quentin on it too! What cool photos. I love the sideways one on the card. At first I thought you have made a Quentin purse/wallet. 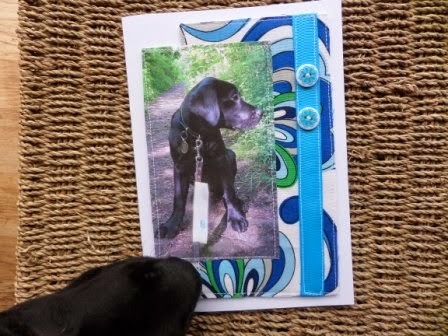 Aww what a gorgeous pressie and card for your mum, it looks like Quentin has placed himself right in the heart of the family as doggies tend to do! Love the fabric on the cushion. I'm sure she was please. What a fabulous present and card, I'm sure your mum is overjoyed with them. I love the swirly blue fabric you've used.